Presently two of Australia’s major media organisations (News Ltd and Fairfax) are lurching through another round of downsizing, attempting to align their strategy with the changing demands of the news-reading community. At the same time, one of Australia’s most successful non-traditional media businesses, Business Spectator, was acquired for a noticeable sum of $30 million. Almost daily I hear from professional services firms that I meet, chat with and consult to that they don’t have time to put into decent online efforts. Don’t have time? Can’t be bothered? Don’t see the point? I get it, I really do. As professional services leaders we’re all busy people. We’re busy delivering to clients, managing staff, hunting for new projects, problem solving on client sites, liaising with influential people and sharing our thoughts. But have you ever stopped to think how your business growth might actually be improved with the addition of a little ‘online community’ effort. Brand equity provides a customer with clear recognition of why you are different and better at what you do than the alternatives. It is built on customer experience with you, your company and your communications over a period of time. Through brand equity you build the type of loyalty that carries way beyond price and can help you when there is occasional problems with your services. Social media enables people you might otherwise have little or no contact with to get to know your business and trust its view prior to seeking advice, services or products. It builds brand equity for a business in a way that has never been available before. Being front of mind is important. One of the most critical goals of professional services is to ensure someone thinks of you at the heat of a moment when their need or problem is gripping them. If you are a part of their community, or they are a part of yours and they see you actively contributing thoughts, ideas or input when they don’t need it, they sure will know where to find you when they do. And you don’t need to be a big business to be incredibly visible in your market, so long as you know exactly whom you are targeting with your services. Different to brand equity is the concept that social media builds a strong brand image for your business. In short, it is the creation of a recognisable set of perceptions about a brand, product or service. The main elements of a positive brand image involve the recognition of a brand’s logo and tagline reflecting the company’s business image and key supporting values. If done well it allows people you might otherwise not have been able to get recognition with to know of and recognise your firm. Brand image is also one of the key components that companies are looking for when they look to buy a firm. 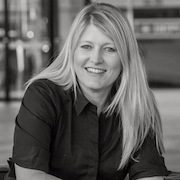 Rebecca Wilson is the managing director of Stretch Marketing, and the founder and publisher of Startsat60.com, Australia’s largest online community and media site for baby boomers. Rebecca guest speaks regularly on marketing to Baby Boomers and leading content marketing techniques all over Australia. Tweet Rebecca on @wilsonbec.